The latest has Phoenix interested in the $7.4 Million man Brad Richards. Could it happen? Word is Phoenix is looking to move Jovanovski and his $6.5 million cap hit. Package him with Cujo, and you could be on to something. I seriously doubt it, but rumours are rumours, and I have to look beyond the mention of interest to see if a deal could be done. In theory it could, but I hope not. I don't like the idea of either of those guys heading to Tampa. Jovo has had health issues, and Cujo is a 40 year old goalie in the waning twilight of his career. I would hate to lose Ritchie for those guys. With free agency starting up Sunday, the NHL released the new cap numbers. The New cap will be at $50.3 Million. That is an increase of $6 million over last season. The Lightning have already stated that they will have a self imposed cap of last season's max, $44 Million. If the Bolts do stick to that $44 mil number, they will have a lot of wiggle room down the stretch to acquire players as needed to head into the playoffs. What worries me is that they couldn't get through the 1st round at $44, they could barely get into the playoffs at that number. Will it be enough this year? The Bolts have been very quiet on the rumor front, leaving me not sure which way to lean when it comes to predicting their free agent acquisitions. I have a feeling they will make a run at Bryzgalov, with Belfore as a back up plan. The team has said they would go into camp with what they have, but I doubt that will happen. As for a second line forward and a veteran defenseman, your guess is as good as mine. I think they will secure their net first and foremost, then see where they are financially and proceed to fill the holes that are left. This upcoming season, Southeast Shootout will be adding a few new contributors, including yours truly. I will be blogging the Bolts, and collectively we will be drumming up the smack in the Southeast Division. After you check out the latest happenings here at Bolts Blog, head over to "The Shootout" to let your voice be heard! TAMPA BAY – The Tampa Bay Lightning have re-signed right wing Norm Milley to a one-year contract, Executive Vice President and General Manager Jay Feaster announced. "Norm Milley is a very solid veteran and leader at the AHL level and has demonstrated that he is on the doorstep of becoming a regular in the NHL,” Feaster said. “We are very pleased that he has chosen to remain with our organization and we look forward to seeing him in Training Camp in September where he will have an opportunity along with a number of other players to make our team. Norm is a high-character player who consistently puts the team first." 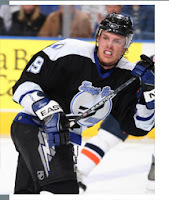 Milley, a 6-foot, 195-pound native of Toronto, played in 14 games with the Lightning in 2005-06. He scored two goals, including the first of his NHL career, and had three points in his first season in Tampa Bay. He scored one goal on the power play and averaged more than seven minutes of ice time per game with the Lightning. The draft is over, and no deals were made. The Bolts are faced with still needing a goalie, a 2nd line forward and 6th defenseman, maybe 2 since word is that Pratt wants to test free agency. The latest rumors swirling about are centered as usual around goaltending. Now it is Anaheim's Ilya Bryzgalov that is the focus. Since Anaheim re-signed Giguerre, conventional wisdom is that they will now attempt to move Bryzgalov. The Bolts being in the mix is possible since the teams have dealt with one another recently in the O'Brien deal at the deadline. Bryzgalov has 1 year left on a deal that will pay him only $1.36 mil next season. The Lightning wouldn't need to give up much to get him, but will need to keep cap space clear to be able to sign him long term. Also looking to test the free agent market is forward Eric Perrin. He was expected to step up and fill the hole left by Modin last season, but that never materialized. TAMPA BAY - The Tampa Bay Lightning made nine selections at the 2007 NHL Entry Draft in Columbus today, using their second round choice (47th overall) to select 5-foot-10, 185-pound forward Dana Tyrell. Tyrell, 18, a native of Airdrie, Alberta, spent the 2006-07 season with Prince George of the Western Hockey League, registering 30 goals and adding 26 assists in 70 games. He finished first on his team with 16 power-play goals and second on his team in scoring with 56 points. Tyrell played at the Under-17 World Championships with Team Pacific and was tied for first on the team in scoring with 10 points in six games. In February 2007, Tyrell was named WHL Draft Prospect of the Month after registering 16 points in 14 games. In 2005-06, he was named the Prince George Cougars’ Rookie of the Year and Scholastic Player of the Year. With their second selection of the day in the third round, 75th overall, Tampa Bay selected 6 foot, 190-pound center Luca Cunti from Zurich, Switzerland. In 28 games during the 2006-07 season he scored three goals and tallied 23 points. Cunti played for Team Switzerland at the 2007 Under-18 World Championships and lead the team in goals with three. The left-hand shot was ranked 12th among European skaters by NHL Central Scouting entering the draft and is regarded as a highly-skilled forward with excellent speed. With the 77th overall selection in the third round the Lightning selected center Alexander Killorn from Deerfield Academy in Massachusetts. This past season the 6 foot, 161-pound native of Halifax, Nova Scotia skated in 26 games and scored 18 goals and 14 assists. The 17-year-old announced in February that he had verbally committed to play for Harvard starting in the fall of 2008. He helped lead Deerfield Academy to a 13-9-4 record in the 2006-07 season. With their 107th overall selection in the fourth round, the Lightning chose left wing Mitch Fadden from Lethbridge of the WHL. A 6 foot, 174-pound native of Victoria, British Columbia, he scored 36 goals and added 48 assists in 71 games in 2006-07. Fadden, 19, was named WHL and CHL Player of the Week on Feb. 5, 2007 after registering 12 points, including back-to-back hat tricks, in four games. He was ranked 51st among North American skaters by NHL Central Scouting. The Lightning then acquired the Ottawa Senators 150th, 183rd and 210th selections in the 2007 Entry Draft in exchange for the Tampa Bay’s 2008 fourth-round selection. With the 150th overall selection in the fifth-round, the Lightning selected 6-1, 175-pound forward Matt Marshall of Noble and Greenough School in Massachusetts. The Boston native scored 14 goals and added 10 assists in the 2006-07 season. Marshall was ranked 63rd among North American skaters by NHL Central Scouting, and is expected to play for the University of Vermont’s in 2007-08. With the 167th overall selection in the sixth round, the Lightning chose 21-year-old left wing Johan Harju from Sweden. A 6-3, 205-pound native of Overtarnea, Sweden, Harju registered 12 goals and 22 points in 55 games in the 2006-07 season with Lulea of the Swedish Elite League. In 98 career games with Lulea in the Swedish Elite League, Harju has recorded 15 goals, 11 assists and 38 penalty minutes. With the 183rd overall selection in the seventh round, the Lightning selected goaltender Torrie Jung from the Kelowna Rockets of the WHL. The 6-1, 169-pound native of Nanaimo, British Columbia played in 33 games in 2006-07 and posted a 3.46 goals-against average and recorded one shutout. Jung was ranked 24th among North American goaltenders by NHL Central Scouting. With the 197th overall selection in the seventh round, the Lightning selected 6-foot-two, 180-pound defenseman, Michael Ward from Lewiston of the Quebec Major Junior Hockey League. The Shippagan, New Brunswick native played in 58 games with Lewiston in 2006-07, registering seven assists and 39 penalty minutes. With their final selection, the Lightning chose Justin Courtnall from Burnaby of the British Columbia Hockey League in the seventh round, 210th overall. The 6-3, 185-pound left wing registered five goals and nine assists in 53 games in 2006-07. Courtnall is the son of former NHL star Geoff Courtnall. Wiht day one of the draft n the books, the Lightning have been silent. The possibility that the Lightning were looking at San Joses Toskala have gone by the wayside as Toronto dealt for him. The stinkin Panthers traded for Nashville's Vokun. The Bolts, well Feaster is saying that he is looking to head to camp with what he's got, Holmer, Ramo and yes, Denis. Un-F'n-Believeable. They bench the guy for the playoffs, opting for rookies to start, and they are unwilling to eat his salary or work a trade? They would rather carry his dead weight for 2 years than his 900K cap hit for 4. I don't get this guy. He really does think that the big 3 is all he needs. There are rumors that the Bolts are interested in Anaheim's Bryzgalov, but I'll believe that when I see it. The Lightning have the 75th pick, and they may use it, or package it in a deal. Either way, it looks like we are due for a re-run of the goalie situation of last season. The Tampa Bay Lightning have re-signed defenseman Shane O’Brien to a two-year contract today, Executive Vice President and General Manager Jay Feaster announced. O’Brien, a 6-foot-2, 228-pound native of Port Hope, Ontario, made his NHL debut last season, playing in 80 games with the Lightning and the Anaheim Ducks, scoring two goals and adding 14 assists. O’Brien, 23, also tallied two game-winning goals and one power-play goal. He ranked seventh in the NHL among rookie defensemen with 16 points and tied for first with two game-winning goals. His 176 penalty minutes also ranked him fourth in the NHL. "Shane O'Brien has already demonstrated to us, in a very short period of time, that he is going to be a perfect fit in our system,” Feaster said. “He skates incredibly well, gets the puck to our forwards in transition, and he has great grit. He is everything we want in a hockey player and we are extremely pleased to have him signed for the next two years. We expect great things from Shane." The defenseman was acquired from Anaheim on February 24, 2007. After joining the Lightning, O’Brien played in 18 games and recorded two assists. His time on ice increased following the trade from 14:03 with the Ducks to 18:07 with Tampa Bay. 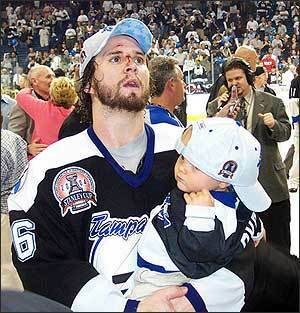 O’Brien played in six Stanley Cup Playoff games with the Lightning in 2007 and averaged 17:11 minutes played per game. He spent the 2005-06 season with the Portland Pirates of the American Hockey League and led all defensemen in playoff scoring with six goals and 22 points, while also leading the league in penalty minutes in the post-season with 81. O’Brien played in 77 regular season games and scored eight goals while adding 33 assists, leading all Pirate defensemen in points and ranking third on the team in assists. He ranked sixth in the AHL in penalty minutes and was tied for 14th for points among defensemen. During three seasons in the AHL, he collected 15 goals and 76 points with 769 penalty minutes in 214 regular season games. While playing in the AHL he increased his point production each year, going from 10 his rookie season to 41 in 205-06. He also played in 43 Calder Cup Playoff contests and recorded seven goals and 28 points with 158 PIM. O’Brien played the majority of his junior career with Kingston of the Ontario Hockey League before finishing the second half of the 2002-03 season with Toronto. In three seasons in the OHL he played in 190 regular season games and scored 28 goals while recording 89 points. He also appeared in 24 playoff games and scored four goals with 11 assists. He was selected by Anaheim in the eighth round, 250th overall, at the 2003 NHL Entry Draft. NEW YORK (CP) - There might be more penalty shots during NHL games next season after the board of governors tweaked some rules Wednesday. A player may now be awarded a free shot if he is fouled on a clear breakaway anywhere in the neutral or attacking zones. Previously, a penalty shot was awarded only when a player on a clear breakaway was fouled on the attacking side of the centre line. Rules on faceoffs, interference and misconduct penalties were also tweaked. All faceoffs must now be conducted at one of the nine dots painted on the rink. Some faceoffs, such as when a puck left the playing surface, were previously held on unmarked ice parallel to the dot nearest the place where the puck left the playing surface. 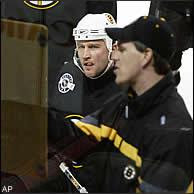 The interference rule was altered so referees can at their discretion assess a major penalty and a game misconduct when an injury results from an act of interference. Previously, only a minor penalty could be assessed for interference. The term "gross misconduct" was eliminated from the rule book. A game misconduct will now be assessed, and accumulated game misconduct penalties can lead to fines or suspensions. We all know he is a UFA, and will not be offered a deal in Tampa, but here's the latest on Feds. Rumors have him going to Atlanta, Carolina, Detroit, with Carolina being the highest on the list. I think he would fit in better in Detroit as a 3rd liner, but that's just my opinion, plus I would like to see him out of the East. Also, there were rumors floating around that the Bolts were trying to deal Denis to Ottawa for Gerber, but that has been quashed. He will probably be dealt or released in the next 2 weeks leading up to the July 1st free agency date. Available goalies for trade are: Manny Fernandez, Vesa Toskala, Cristobal Huet, Evgeni Nabokov, Martin Gerber, Hannu Toivonen, Nick Khabibulin, David Aebischer. Robert Esche and probably a few others I haven't thought of. So there are quite a few possibilities out there. The free agent pool is getting shallower, and includes Hasek, Cujo, Belfore, and Giguerre. I wouldn't be surprised to see Feaster make a run at Fernandez. Perhaps offering up Denis in return. The Entry Draft starts Friday night, not that it matters to the Bolts who don't have a 1st rounder. Free Agency opens July 1st, cap rumored to be raised to between $50 and $52 mil. Apparently Philly came calling, wanting to trade their 1st round pick, #2 overall. They were inquiring about Vinny or Brad, and were told that they were not on the market. Rest easy Bolts fans, these two are not going anywhere. The Lightning offered Artyukhin the same three-year, $1.575-million deal they gave wing Nick Tarnasky, but general manager Jay Feaster said the deal was turned down. The offer, which would have paid $500,000, $525,000 and $550,000 was a step up from the one-year, $475,000 offer he had already turned down. Artyukhin's agent, Mark Gandler, is probably the one to blame for the situation. Apparently he is regarded as a bottom dweller of an agent, and by the way he is apparently advising Artyukhin, I can believe it. The Lightning have made more than good on their offers to him, right on par with Tarnasky, who I think has more upside. Yet the big Ruskie keeps turning up his nose...at least through his agent. It's time for the Bolts to deal this guys rights and get something in return. He could be packaged in an attempt to get a goalie or forward, perhaps to San Jose for a Toskala. I don't care if I ever see this guy back in Tampa, the only memorable thing he ever did was to rip a guys helmet off and hit him with it...that was hilarious. Other than that, what has he done? Get rid of him and get something useable in return. The Tampa Bay Lightning have signed free agent left wing Jan Hlavac to a one-year contract, announced. Hlavac spent the previous three seasons playing in Europe. Hlavac returned to Europe after the 2003-04 season following five years in the NHL. He has played in 356 career NHL games with the New York Rangers, Vancouver Canucks and Carolina Hurricanes. He has scored 78 career NHL goals and recorded 189 points, and his best NHL season came in 2000-01 with the Rangers as he scored 28 goals with 64 points, both career highs. 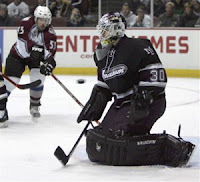 Hlavac spent the 2006-07 season with Sparta Praha of the Czech Elite League. He scored 20 goals and recorded 31 points with a plus-8 rating in 41 games with Sparta. He ranked fourth on the team in goals and points while ranking fifth in assists with 11. He also played in 16 playoff games, scoring eight goals and adding two assists. He was second on the team in playoff goals. After trying and failing to aquire Gratton prior to last season's trade deadline, Feaster finally got his man. He was able to get center Chris Gratton from the Florida Panthers in exchange for a second-round pick in the 2007 or 2008 NHL Entry Draft. Gratton, the Lightning's first-round choice (third overall) at the 1993 Entry Draft, played in 404 games with the Lightning from 1993-97 and 1998-00. The 31-year-old served as Tampa Bay's captain during the 1999-00 season and recorded 88 goals and 236 points in his two stints with Tampa Bay. He recorded career highs in goals (30), points (62) and penalty minutes (207) in 1996-97 with the Lightning. A 6-foot-4, 221-pound native of Brantford, Ontario, Gratton spent the previous two seasons with Florida. 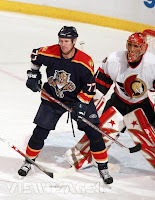 His best season with the Panthers was 2005-06 when he scored 17 goals and recorded 39 points. Last year he played in 81 games and netted 13 goals with 35 points while also leading the Panthers in face-off percentage at 51.2 percent. "Chris Gratton is the ideal third-line center for our hockey team," Feaster said. "He has great size and strength, he is very good on face-offs, he has excellent grit and is willing both to take care of himself and defend his teammates, he is fearless when standing in front of the net on the power play and he has developed over time into a solid penalty killer as well. We believe Chris brings to our club a host of elements that we need in order to have the depth necessary to continue to be a top caliber team. "We have been pursuing Chris for some time now, and I honestly thought we were going to be able to get a deal done to acquire him at the trade deadline this past season. While that did not happen, we never lost our interest in adding Chris as an ideal complement to Vinny and Richy as a big, strong, multi-faceted third-line center who shares our organizational commitment to winning. They say in life that 'the third time is the charm' and we truly believe that his third time in a Lightning uniform is going to be a great one for Chris and our team, and we welcome him back to the Lightning family." Gratton has never lived up to his first round pick potential, but is a good 3rd or 4th liner. He could center a line with Tarnasky and Roy, or with Perrin and Karlsson. He will make $1.5 this upcoming season. Nick Tarnasky re-upped Monday with the Lightning. The deal is for 3 years, $1.575mil. Last season the Nasty Man appeared in 77 games and scored five goals (one game-winner) while recording nine points. He registered the first multi-point game of his career with a goal and an assist on March 10 at Calgary and scored on his first career shootout attempt to win the game March 1 at Washington. He made his Stanley Cup Playoff debut in the 2007 Eastern Conference Quarter-Finals and played in six games. He was a great complement to a checking line that included Andre Roy and Andreas Karlsson. "Nick Tarnasky has all the makings of a true dominant power forward in the NHL," Feaster said. "He has size, strength, solid skating ability, willingness to commit himself to the defensive side of the game and an under-developed ability to finish that even he is just starting to harness and explore." "I love him, " Feaster said. "He's one of my favorite guys because he brings so much to the table. He's only scratching the surface of how good he can be." "The main thing is I want to contribute more offensively, " said Tarnasky, who averaged 6:29 of ice time. "It's nice to see where I ended off last season. It's a good spot to start at." As for where the 6-foot-2, 233-pounder ends up, Feaster said, "If he ever realizes he belongs in the league and can actually play, he'd bear down and finish those chances and opportunities he created for himself as opposed to being surprised he had them." In two seasons with the Lightning Tarnasky has played in 89 career games. He played 12 games and recorded his first career point, an assist, in 2005-06. Before joining Tampa Bay he played 148 games with the Springfield Falcons of the American Hockey League. He scored 21 goals and had 40 points in his first two AHL seasons. Wanvig signed a 1 year 2-way contract. Wanvig, acquired February 1 in a trade with Atlanta, appeared in four games with the Lightning last season. A 6-2, 210-pound native of Calgary, Alberta, Wanvig skated in 23 games with Springfield of the AHL after being acquired, recording 11 goals and seven assists. He started the season with Chicago of the AHL, tallying 10 goals and 21 points in 26 games. The Tampa Bay Lightning have entered into a one-year affiliation agreement with the Mississippi Sea Wolves of the ECHL, it was announced today by Executive Vice President and General Manager Jay Feaster. Mississippi will serve as the Lightning’s primary ECHL affiliate starting with the 2007-08 season. Lightning Assistant General Manager Claude Loiselle, Lightning Assistant to the General Manager Ryan Belec, Mississippi President Bill Yates and Mississippi Head Coach and General Manager Steffon Walby made the announcement at a 3:30 p.m. news conference today in Biloxi. The Lightning organization will provide the Sea Wolves with players under NHL and AHL contracts. The Mississippi coaching staff will not be effected. Tampa Bay previously had secondary affiliations with Pensacola, Johnstown, Toledo, Chesapeake, Nashville and Knoxville of the ECHL. Tampa Bay announced on March 29, 2007 that they entered into a multi-year affiliation with the Norfolk Admirals (AHL) to be their top minor league affiliate. The Sea Wolves entered the ECHL in 1996 and have played 10 seasons in Biloxi. They will return to the ice this season after missing the previous two seasons due to damage inflicted on the Mississippi Coast Coliseum by Hurricane Katrina which included the loss of two Zambonis, ice making equipment, dasherboards, team offices and all hockey equipment. Mississippi won the Kelly Cup as champions of the ECHL in 1999. The team will play in the league’s Southeast Division. They will open their season on October 19 at the Florida Everblades in Estero. When Will the NHL Wise Up? NEW YORK -- The Stanley Cup finals have brought record low ratings to NBC for a prime-time program, sports or otherwise. Ottawa's 5-3 victory over Anaheim in Game 3 Saturday night received a 1.1 national rating and a 2 share, the network said Tuesday. That matched a rerun of "The West Wing" on July 23, 2005, which also drew a 1.1 rating. Saturday's rating was down 31 percent from last year's Game 3 between Edmonton and Carolina, which had a 1.6/3. The national ratings for Monday night's Game 4 declined less sharply from last year. The Ducks' 3-2 victory received a 1.9/3, down 5 percent from the 2.0/3 for Game 4 in 2006. How much worse is it going to have to get in the States before the NHL gets their product back on ESPN? Hell, after these ratings, would ESPN even take back the NHL? TV is about making money, and a 1.1 and 1.9 don't equal squat. The NHL may have to pay ESPN to take them back. Oh wait, now that Versus is showing minor league MMA (WEC), the huge amount of cross promotion of hockey should....wait, that's right, most of the country doesn't get Versus. I know, maybe the NHL/Versus could start a reality show called the Ultimate Goalie, where guys live in a house and compete to be the next Habs netminder. Each week they would have to go 1 on 1 with the likes of Brett Hull and Gordie Howe. I'm sure that would drum up interest in hockey. Yeah right. Truth is, the lockout killed what little interest the casual US sports fan had in the game. Throw in non-traditional Cup finalists Carolina and Edmonton last season, Anaheim and Ottawa this year, and aside from us hockey nuts, no one cares. Most Americans know the Stanley Cup when they see it, but ask them who is playing for it this year and I bet very few know. The NHL has a huge task ahead of them in trying to rekindle the US interest in Hockey. So far, it seems they have no idea how to do it. OTTAWA (CP) - The Rocket Richard Trophy finally has a winner that comes from the same province as the Rocket himself. Quebec native Vincent Lecavalier scored 52 goals for the Tampa Bay Lightning this season to lead the entire NHL and was given the Richard Trophy at an awards luncheon on Saturday. The Richard Trophy was first handed out in 1999. It's previously been won by Canadians from Ontario and Alberta along with Russians, a Finn and a Czech. Lecavalier is the first Francophone to have his name inscribed on it. "It means a lot," said Lecavalier, who was born in Ile Bizard, Que. "Maurice Richard is a legend in Montreal and even though I didn't really see him play, we still heard stories about him. "I never thought that it would happen and it did. I'm very happy that everything went the way it did this year." Richard's younger brother, Henri, presented Lecavalier with the trophy. He accepted it by shaking hands with Henri Richard and saying: "Merci beaucoup." It was the final award presented on a day when Sidney Crosby was given the Art Ross Trophy for leading the NHL in points and Minnesota Wild goaltenders Niklas Backstrom and Manny Fernandez shared the Jennings Trophy for allowing the fewest goals against. After this weekends debacle of not being able to see game 3, I have Verizon and no HD, so that is why I couldn't see it, I wondered just what the NHL is thinking. Versus reaches about 20 million...yes 20 million fewer homes than ESPN, and as for NBC, well, they moved a Stanley Cup Playoff game to Versus to make room for a horse race. They have no loyalty to the NHL. I know when Bettman signed the original deal it was guaranteed money for the league coming out of the lockout. But now, the decision to take the money as opposed to get the exposure on ESPN seems to have been the wrong one. In the long run, the money the league got up front would have been recovered by the sheer exposure offered by ESPN. Now there is no longer NHL2night, few NHL highlights that are non-fights on Sports Center, and still no NHL Network as was agreed to be launched by now when Comcast/VS. got the NHL deal. The result, a network (VS.) that could only deliver a .5 rating for games 1 and 2, in TV land that is pathetic. A partnership with NBC that allows its local affiliates to pre-empt games for what ever reason they choose, and not have to find other outlets (Tampa & NC this past weekend). This is how the "New NHL" wants to market itself? The salary cap was a good thing, not worth losing an entire season, but it has created a great new game of hockey. Now it is up to the NHL to market it, and so far they have fallen flat on their face. What to do? Like a guy crawling back to his ex, put your pride aside and got to ESPN and beg them to take you back. Tell them you were wrong and that it is they who truly understand you. Take what ever financial terms they offer, and be glad you now have 20 million more outlets for exposure, a nightly recap show exclusive to your league, and the possibility of finally attracting new fans to your revamped and great game. Check That...Game now on Catch 47 & WFLA's HD? What looked like a done deal turned into no deal, then became a new deal by day's end Friday. The end result means Game 3 of the Stanley Cup finals between Anaheim and Ottawa will air on WFLA, Channel 8's high-definition station and Bright House Networks Catch 47 tonight at 8. The Tampa Bay Lightning originally had purchased airtime on WTTA, Channel 38. But late Friday afternoon, WTTA's parent company, the Sinclair Broadcast Group, decided not to allow the Lightning to purchase the time. "We thought we had a deal, but by the end of the day it fell through," said Bill Wickett, vice-president of communications for the Lightning. On Friday night, however, it was announced the game would be on WFLA-HD and Catch 47. The game is being broadcast by NBC, but WFLA, Channel 8, has a commitment to air the All Children's hospital telethon. The remainder of the series will air on WFLA. According to WFLA's Website, to see the game on Veizon you need to tune to their digital channel 808 or their HD channel 835. The Bolts know how important it is to get hockey seen in this market, and they have stepped up. "The Lightning wanted to make sure their fans could see Game 3 of the Stanley Cup finals between Anaheim and Ottawa so the team has purchased the air time on WTTA, Channel 38. The telecast, scheduled to start at 8 p.m. Saturday, originally didn’t have a home because WFLA, Channel 8, is airing the annual All Children’s Hospital telethon. WTTA will air NBC’s feed. The Lightning will own all the local airtime on the telecast. Campbell said he didn’t know how the team would use the time but did say there will be personnel working the telephones Saturday night. " Great job Lightning!!! Shame on You Channel 8. In case you haven't heard, channel 8 is preempting the game Saturday to run the All Children's Telethon. As of yet, there has been NO alternate channel named that will carry this game in the Tampa market. If you want to see this rectified, call NBC Corporate (212) 664-4444, and Channel 8 locally (813) 228-8888, and tell them to get off their behinds, and get this game on down here. To think that in an NHL market, there would be no way to watch game 3 of the Stanley Cup Finals is just ridiculous. pre-empted by our Annual All Children's Hospital Telethon. Game # 4 will air on our Station...Monday, June 4th @ 8-11PM. Game # 5 will air on our Station...Wednesday, June 6th @ 8-11PM. rejoin NBC @ 7PM on Sunday evening. TV Stations...but, there were no open time periods. -Like I said, this is just ridiculous. Go to a hotel? bar? Basically you are SOL, leave us alone. As for there were no open time periods on other channels..I gues Channel 32 running Masterminds, Cheaters and Jerry Springer is too important to replace with the Cup Finals. The Telethon is a good thing, but some arragement should be made. Shout out to Bolts Mag, Southeast Shootout, and Sticks of Fire for helping to get the word out. As expected, Mike Sullivan has been hired on by the Lightning to replace fired assistant Craig Ramsay. He will take over Ramsays former responsibilites as coach of the defense and penalty kill. Sullivan spent 3 seasons as head coach of the Bruins, and most recently coached the US team at last month's World Championships. He also played for Tortorella while with the Coyotes. Prospects that signed are goaltender Riku Helenius, and center Chris Lawrence. Both signed three-tear deals. Neither is expected to play any higher up than Norfolk next season.